Within this two part* Star Wars video game series tied in with the prequel trilogy, the actions and speech of a player’s surrogate character determine whether he is an ally of the light or dark side of the Force. This alignment will send the player on one of two divergent paths: reaching the Star Forge to defeat the Sith (the light side) or overthrow the existing Sith leadership (the dark side). Thus, players can opt to be hailed as a savior or make The Empire cower as an intimidating Sith Lord. *The third part of the series was ultimately cancelled. 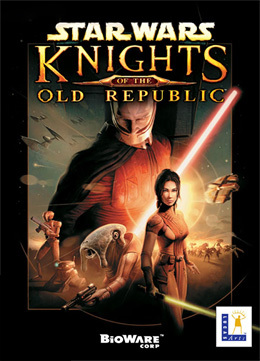 Star Wars: The Old Republic takes place 300 years after these two games, and is distinct in that it is a massively multiplayer online role-playing game (MMORPG).